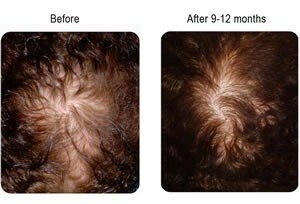 Hair loss and thinning hair can be caused by a variety of internal and external factors. Revivogen is different than other natural hair restoration and synthetic treatments because it stops the hair loss process by targeting DHT production and optimizing the hair production cycle using natural ingredients with scientifically proven effectiveness against hair loss. 1. 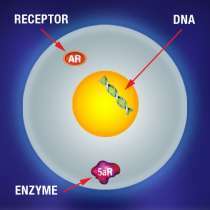 DNA resides in the nuclei of the cells, and provides genetic blueprints that instruct cells how to act. The process of hair growth is part of our genetic makeup, and the DNA inherited from both parents dictates one’s predisposition to hair loss. When these hair loss genes are present, they can be triggered by DHT, a hormone present in both men and women after puberty. 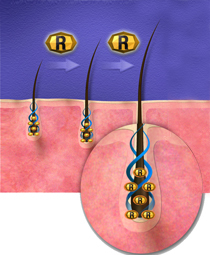 Hair loss is genetic but can be stopped and reversed with natural hair restoration. 2. 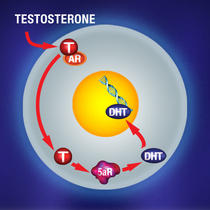 When testosterone enters the hair follicle cells through gateways known as androgen receptors, it interacts with enzymes that convert it to DHT (Di-Hydro Testosterone) an unwanted byproduct. Revivogen blocks the androgen receptors and prevents testosterone from entering the cell. 3. 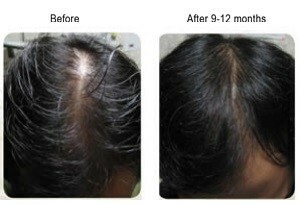 The enzyme 5-alpha reductase (5AR) is present within the hair follicle cells. This enzyme is responsible for converting testosterone to DHT, which interacts with the hair loss genes and hinders normal hair production. Revivogen inhibits 5AR enzymes to reduce DHT production. 4. When DHT production is reduced, hair loss genes become dormant, hair loss ceases and the follicles begin producing healthy, normal hair once again. For even more dramatic results, Revivogen also contains natural ingredients that have been proven to stimulate the hair follicles and activate their growth phase. The ingredients found in Revivogen® are backed by clinical science that proves they address the various causes of hair thinning and hair loss. Board-certified dermatologist Alex Khadavi, M.D. selected Revivogen’s active ingredients because they are natural compounds that have been proven to inhibit 5-alpha reductase (the enzyme necessary for DHT production), block the androgen receptors and promote the growth of normal, healthy hair. Revivogen’s ingredients include gamma linolenic acid (GLA), alpha linolenic acid (ALA), linoleic acid, oleic acid, azaleic acid, vitamin B6, zinc, saw palmetto extract, beta-sitosterol and procyanidin oligomers. Revivogen is the only product line that features these ingredients in an easy-to-use three-step topical regimen. Gamma Linolenic Acid (GLA), Alpha Linolenic Acid (ALA), Linoleic and Oleic Acid are essential fatty acids found in plant oils. These fatty acids have been individually proven to inhibit 5-Alpha Reductase. 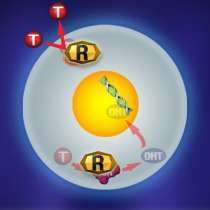 In fact these are the most powerful inhibitors of 5-Alpha Reductase known today and not only they inhibit the Type II form of the 5-Alpha Reductase which other products like Propecia® inhibit, but also the Type I form of the enzyme which is present in high concentrations in the scalp, sebaceous glands, and the skin. Additionally GLA, ALA and Oleic acid have potent anti-inflammatory properties. 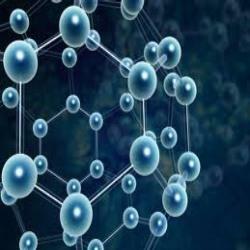 Azelaic acid is a naturally occurring dicarboxylic acid found in whole grain cereals, rye, and barley and animal products. It is FDA approved as a topical preparation for treatment of acne and is effective against a number of other skin conditions when applied topically. There is strong scientific evidence that Azelaic Acid and Zinc are potent inhibitors of 5-Alpha-Reductase. When Azelaic acid, Vitamin B6 and Zinc Sulfate where added together at very low concentrations, 90% inhibition of 5 Alpha-Reductase activity was obtained. The synergistic activity of these compounds against 5-Alpha-Reductase makes this combination very effective in treatment of male pattern baldness. aw palmetto has been extensively studied over the past several years for the treatment of enlarged prostate in men ( BPH ). Saw Palmetto extract which is a known anti-androgen is the liposerolic extract of the fruit of Saw Palmetto. Saw Palmetto has shown to effectively block DHT and is also believed to block the androgen receptors which are found on the hair follicles. Like GLA and ALA it also blocks Type 1 and Type 2 forms of 5 alpha-reductase and has shown to be more potent than Finasteride, the active ingredient of Propecia. Procyanidin Oligomers (also known as Proanthocyanidin) are naturally derived ingredients that have shown to stimulate hair growth similarly to Minoxidil (Rogaine®). Recent studies by Japanese scientists have shown that Procyanidin Oligomers possess growth stimulation activity toward hair epithelial cells in vitro and stimulate anagen induction in hair follicles in vivo. 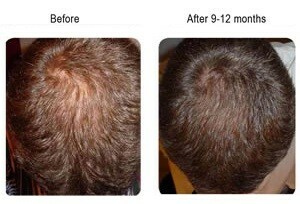 Addition of Procyanidin Oligomers to Revivogen is intended to increase the hair growth stimulation properties of the formula. By combining GLA, ALA, Linoleic Acid, Azelaic acid, Vitamin B6, Zinc Sulfate and Saw Palmetto extract, Revivogen is a natural yet extremely powerful anti-DHT formula. These ingredients work through different mechanisms to synergistically inhibit both type 1 and 2 forms of 5-Alpha Reductase and decrease DHT locally. By decreasing the DHT levels, hair follicles can grow and thicken naturally, leading to a fuller, healthier scalp without the side effects associated with synthetic drugs. In three Simple Steps, you can be on your way to thicker, fuller, healthier hair. 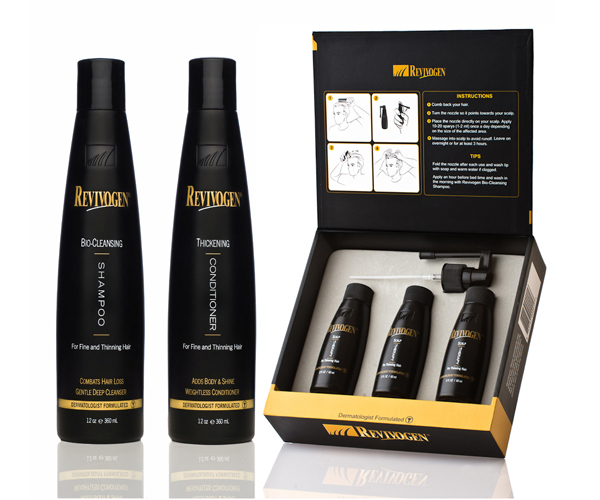 The Revivogen® system features three natural hair restoration products. Revivogen’s Scalp Therapy, Bio-Cleansing Shampoo and Thickening Conditioner work together to halt the production of DHT, which is the root cause of hair loss.